2. What does alltender.com do? 3. What services does alltender.com provide? 4. What products, services or expertise are placed within the alltender.com system? 6. How I can get the information about my exact requirement? 7. Can I change my selection? 8. Where are the sources of tenders? 10. Does alltender.com deal directly with either the Purchaser or Supplier? 11. Is alltender.com open to everyone? 12. What are the benefits of using alltender.com? 13. What are the Service Charges? 14. How do I pay for services? 15. Is there any trial subscription system to evaluating the service? 16. What languages can you use? 17. Who are the Purchaser and Supplier? Alltender.com is an e-tendering service that simplifies tendering processes by creating, managing, displaying and distributing tender information in different perspectives. It supersedes traditional time consuming paper-based tendering information methods. Alltender.com provides a subscription service that enables the Suppliers, Contractors and the Auctioneers to get information via an electronic information system. They are able to view by Internet browsing the Tender/Auction information in a specified format designed by Advanced Information Systems and also the graphic image of the Tender Notice. Registered Subscribers can also receive personalized and customized email notification of Tender or Auction Notices that match their subscripted profile, or they can receive the information in a hard copy via courier. Also purchasers can advertise their Tenders, Request for Information, Request for Proposal, Request for Quote, and Expression of Interest notices on alltender.com. These notices can be accompanied by documents, which suppliers/contractor/auctioneers of services or products can download and view. What services does alltender.com provide? What products, services or expertise are placed within the alltender.com system? Alltender.com is an information based service system. It aims to facilitate the procurement and supply of services, consultancy, products or any other input requiring suppliers from the market to respond with prices, quotes, tenders and information. Supplier/Contractor/Auction Bidder subscribers receive Tender Notices specific to their category and requirement automatically through Web Browsing and also via E-Mail. Tender callers can enter into ONLINE TENDERING SYSTEM of alltender.com which provides comprehensive management and processing. How I can get the information about my exact requirement? Our system will automatically evaluate your criteria of requirement as per your priority of item in the Preference Form filled in by you during online registration. If you think you are not receiving tenders as per your requirement, our support team will assist you to settle the issue; you are requested to create a support request. Yes, you can change your selection anytime online by editing your Preference Form from your Dash Board. alltender.com system will be updated automatically. Where are the sources of tenders? We source the Tender Notices from all the major national daily newspapers around the country, online websites and also by direct contact with the Tender callers. Alltender.com is accessible by secure login process of user id and password which is issued upon registration. Does alltender.com deal directly with either the Purchaser or Supplier? No. alltender.com is an independent and totally neutral information system. We do not see who is transacting within the system nor we can influence or determine any tendering process. Is alltender.com open to everyone? Yes, the site is open for all to visit, but the information services it provides are only for it's registered subscribers. Click here for viewing subscription Process. What are the benefits of using alltender.com? Alltender.com is a specialist solution provider which gives Suppliers and Purchasers the confidence of accessing one source which has a large and comprehensive user and information base. 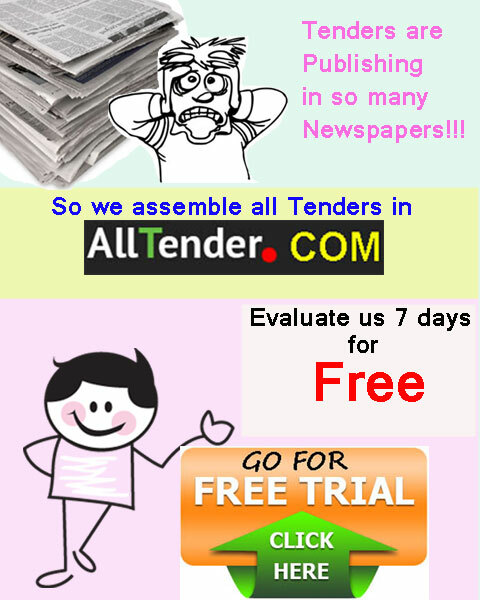 alltender.com completely automates the information and serves the subscribers as per their requirements. Click here for User Benefits. Alltender.com is a free to all type service. After registration, anyone can view the tender notices by browsing the site. Registration is also free, but there is a subscription charge for the optimum benefit of our service. Subscription fees are based on the service requirement by the subscriber. To view the details of subscription fees, Click here. The Supplier, Contractors and Auctioneer can pay automatically by purchasing a Subscription card in cash. If you want pay by cheque, it must be an A/C payee Cheque only in favor of alltender.com. Is there any trial subscription system to evaluating the service? Yes, there is a Free 10 day's subscription opportunity for the Suppliers, Contractors and Auctioneers for evaluation instead of alltender.com's one year long regular subscription scheme. What languages can you use? Currently, alltender.com is available only in English, however as our market expands we will also provide access in Bangla in near future. Who are the Purchaser and Supplier? Purchasers are generally Government, Sector Corporations, UN Agencies, NGOs and Large Private Organizations seeking responses from the market prior to the procurement of goods, services, works or expertise. Suppliers vary from small business to major corporations seeking new business opportunities from the market or business intelligence within vertical market segments. Many suppliers, from very small to large corporations, use alltender.com to watch tender notice information of the country.